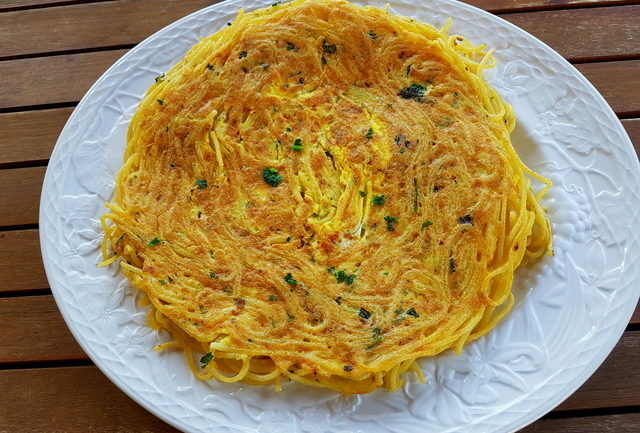 Vermicelli pasta frittata from Basilicata. There is an Italian expression ‘hai fatto una frittata’ which more or less means you have made a mess (figuratively or literately!). Perhaps, the expression came into being when a frittata was merely a way to use up whatever leftovers were in the fridge and not actually considered a culinary delight! However, the humble frittata or Italian omelette (as it is sometimes called ) has gone up in the world and can be found on many English language and Italian recipe sites and has even had articles written about it! The difference between Italian frittata and French omelette? Apart from the eggs, which of course are standard, there are many different ingredients used in Italian frittatas. The main differences between an Italian frittata and a French omelette are that the ingredients are mixed into the eggs before cooking, rather than placed onto the eggs after they have already started cooking in the pan, and a frittata is always circular in shape, thicker than an omelette and takes longer to cook. The French also don’t put pasta in their omelette! 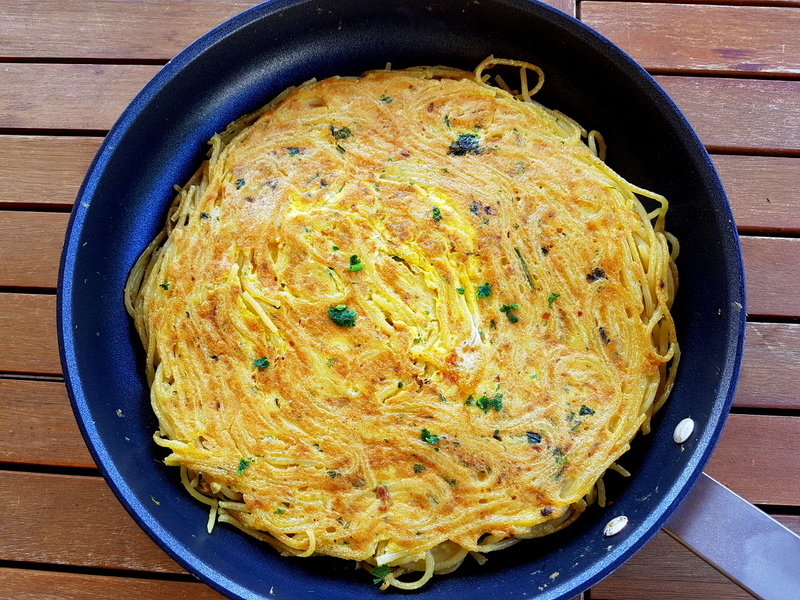 The Italians do and pasta frittatas are very popular and traditional throughout Italy. 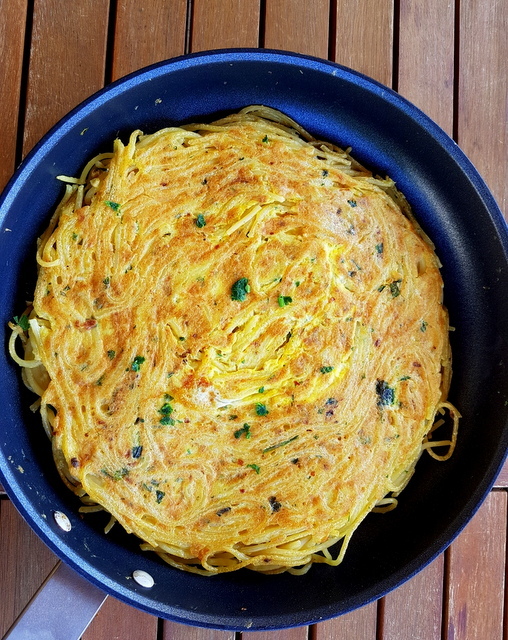 Whether as a result of frugality or necessity, the pasta frittata was most definitely born out of a desire to use up leftover pasta, most commonly long pasta such as spaghetti, vermicelli, bavette etc. Italians use both leftover plain pasta and leftover pasta already mixed with a sauce to make a pasta frittata. 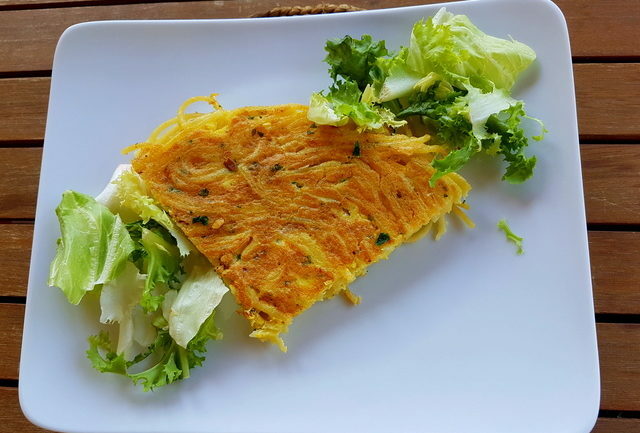 There are a number of traditional recipes from different regions for pasta frittata, especially in Southern Italy, like this one for frittata di vermicelli di Basilicata. However, pasta frittata is a versatile dish that can include almost anything you have in the fridge, as long as it goes with eggs! Of course, you don’t need to have leftovers to make a frittata. Nowadays, many people just choose to make it from scratch. 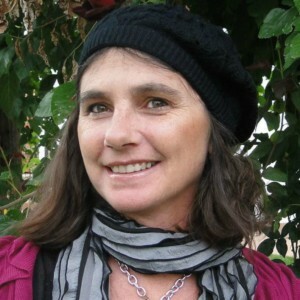 Some also deliberately cook extra the day before in order to make a frittata the following day. Italians aren’t big breakfast eaters and what breakfast they do eat is normally sweet. So, frittata with or without pasta is not a typical breakfast choice here. It’s a quick light meal or snack. 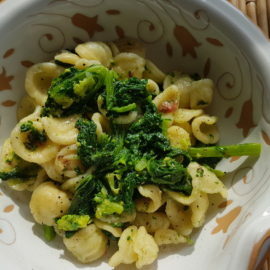 This recipe from Basilicata has only a few ingredients but it’s very tasty. You may find the idea of anchovies in it strange, but I have to say they give it a great depth of flavour. 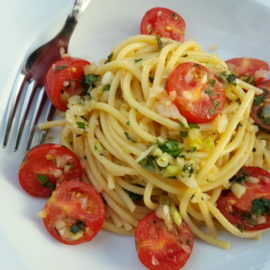 To my mind, it tastes like pasta ‘aglio, olio peperoncino‘ (yes it contains peperoncino!). 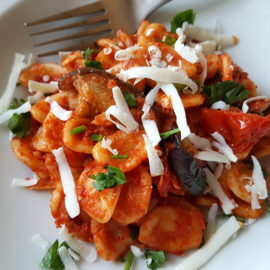 So, if you like that pasta recipe you must give this one a try! If you want to save this frittata recipe for later, you can print it, bookmark this page or save it to Pinterest. 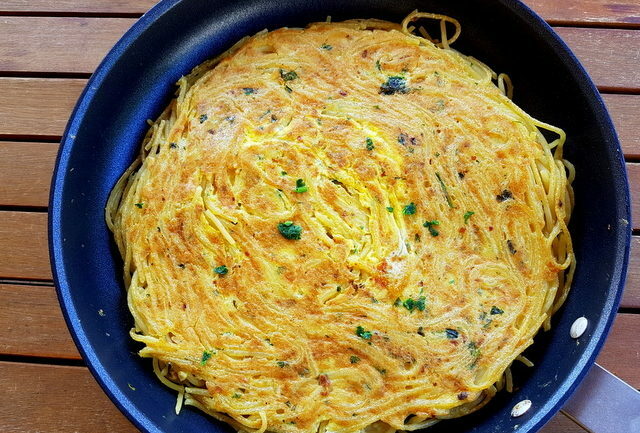 A typical frittata recipe from Basilicata that is both tasty and quick to make! If you are using uncooked pasta, cook the pasta al dente in plenty of salted boiling water according to the instructions on the packet. Drain it and allow it to cool. 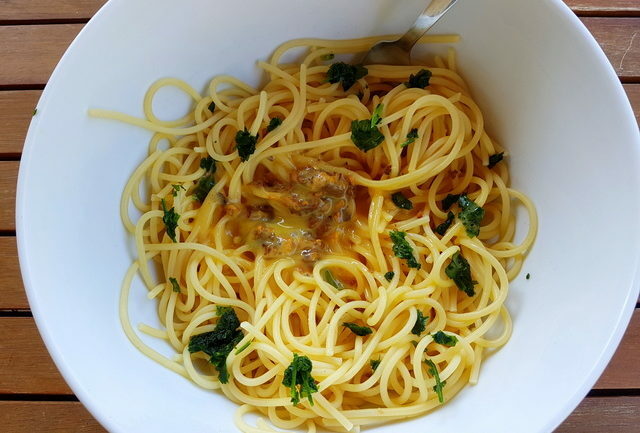 Fry the chopped anchovies, peperoncino flakes and chopped garlic in extra version olive oil until the garlic starts to soften and the anchovies begin to melt. Don’t let the garlic brown. Add the garlic mixture to the cold pasta, along with the eggs and parsley, some salt and pepper. Mix everything together well. Pour the mixture into a large frying pan and fry, turning the omelette to cook on both sides. Serve immediately cut into slices with a sprinkling of parsley. This reminds me of my favorite childhood meal! Good memories and a very tasty recipe! I bet this is so delicious! Could you serve it with a sauce? I’ve made a handful of fritattas before, but never with pasta! Definitely going to try this. I love the sound of this! I’ve never had an italian frittata before, and had no idea it was made with pasta. Yum! 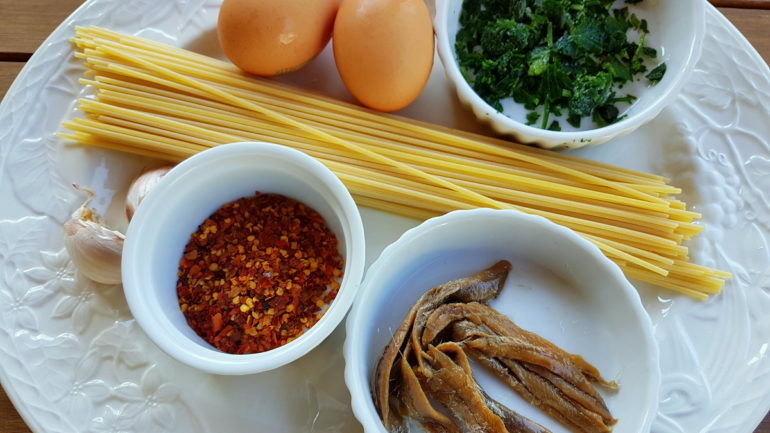 such a simple and delicious looking recipe, love the peperoncino in this! I have made it with bolognese sauce and lots of grated cheese. Simply delicious ! That sounds delicious Joanna. 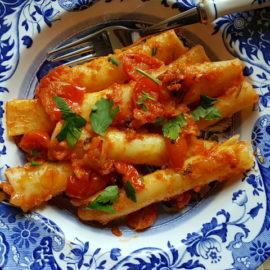 I will have to try it next time I make bolognese! Have a lovely weekend!